But What Will I Leave The Children?! I’m not a wealthy woman. So far from it it’s giggle worthy. I have the same pipe dreams as everyone else about winning the lottery and living a life of leisure in my 4 bedroom house that has a library with floor to ceiling bookshelves. I’d eat seafood every night except for the nights I was eating steak of course. My kids would never need anything and I would be able to leave them large inheritances…such large ones that I would have around the clock security and metal detectors at the front door for when they came over to fawn over me and ask about my health. What?! I believe in being cautious! But now that I have started this blog, my poor kids are screwed. They get nuthin’. Cause all my recipes are going to end up on here eventually. Such as today as I post my chocolate chocolate chip banana bread recipe. So what will I leave the children? Some Andy Gibb albums, figurines of a pig, old clothes and Bobby Goldsboro cassette tapes. So kids… don’t fight over it all. And be nice to the piggie. 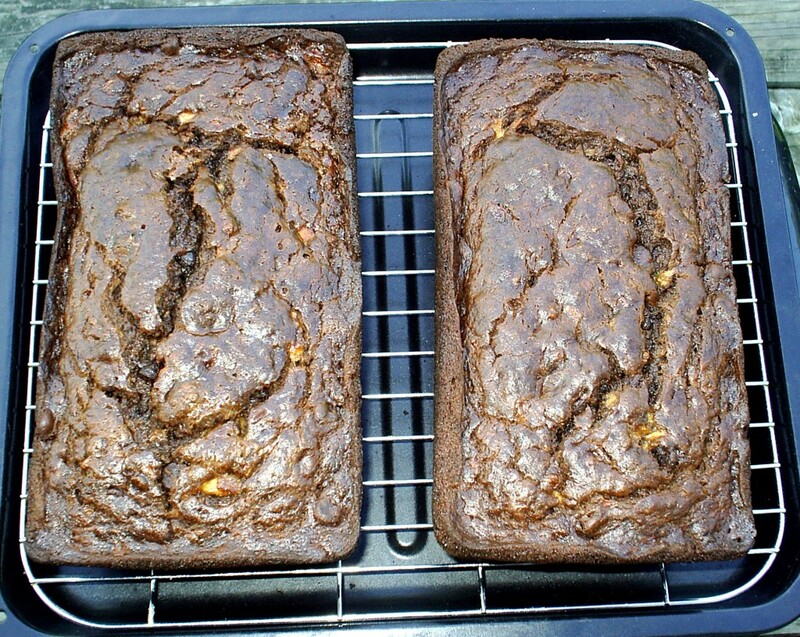 Grease and flour two loaf pans or use the cooking spray that has both oil and flour in it. Either nine inch or eight inch will work. I use nine inch and that is what my cooking time is based on. In a small bowl,mix together the flour, cocoa powder, salt and baking soda. In a large bowl, cream the butter and sugar. Add the bananas and mix well. Mix in the eggs, vanilla extract and banana extract. Add the dry ingredients to the wet ingredients and mix just until combined. Mix in the chocolate chips and walnuts if you are using them. Pour into the two pans and bake for 60 to 70 minutes or until a toothpick or skewer poked into the center of the loaf comes out almost clean. It’s ok if there are a few moist crumbs on it.. Let it cool for five minutes in the pan then turn it out onto a wire rack to finish cooling. 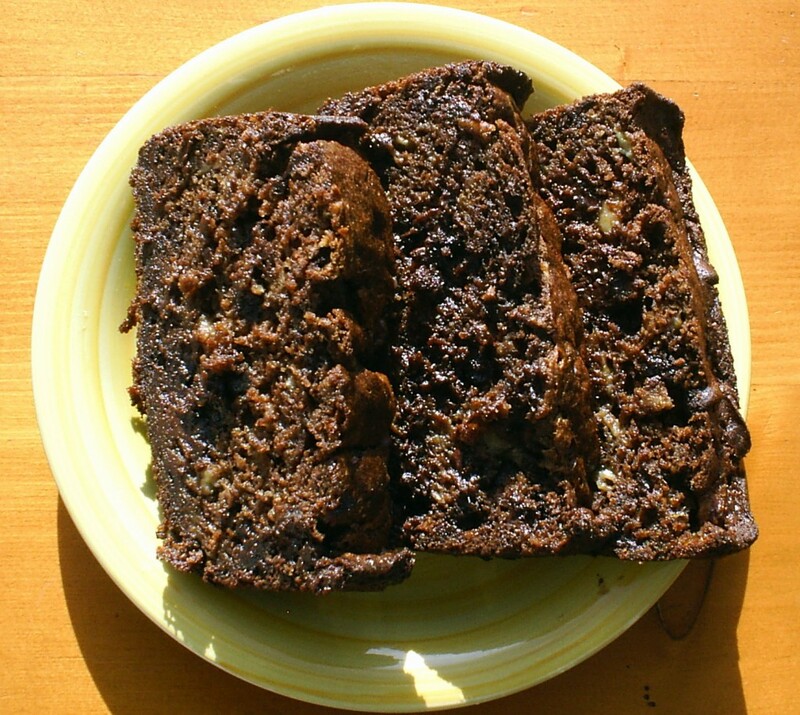 This entry was posted in Quick Breads, Sweet Baked Goods and tagged banana, chocolate, quick breads by Janet. Bookmark the permalink. You’re packing a loaf for me to take to work, right? What? WHAT?!?! Don’t leave me hanging woman! Sounds good though. Bananas are one of the only fruits I can still eat, and I can tell myself it’s healthy because it has fruit in it. I have to say, it is a really good banana bread. I have been making this for years now. The original recipe was soooo boring and I had no choice but to mess with it. It was a moral imperative. LMBO! Ummm…oops? I’m off to see the edit, the wonder edit of Oz!